A few weeks ago we talked about the EU and its plan to introduce new copyright laws in the shape of Article 11 and Article 13. I suggested the EU would be stupid to do so because they don't understand what they would mean for the internet. I hoped they would be watered down or rejected entirely and that saner minds would prevail. So the EU now has a new approach to copyright which will entrench existing businesses as leaders in their fields (think Google, YouTube, Facebook et al) and make it cost prohibitive for any new provider to enter the market. The Two Pauls' World of IT will, I am sorry to say, not be coming to a web browser near you any time soon. The two articles are in and of themselves quite laughable really but put together they spell out the end of the internet as we know it. The internet is, as one pundit said so eloquently, a giant copying machine. Everything we do is copied and shared around. My email doesn't travel, despite our terminology, it isn't 'sent' anywhere. I have the original on my machine, a copy is made by my ISP, it's copied to the recipient's ISP, from there to the machine they use to receive it, and so on. However, now if we're sending and receiving materials that may be copyrighted (that is, if I talk about Mickey Mouse or post his likeness for example) my ISP is liable to do something about it. Of course, I'll be using acceptable and commonplace laws to defend myself. It was free speech. It was parody. It was a quote for review purposes. It wasn't actually their copyright to begin with. But none of it will matter because the ISPs and those responsible for hosting content will strike first, lest they be sued as a co-defendant. And knowing the American legal fraternity as I do (motto: sue them all, let god sort it out"), we're likely to see attacks on free speech, on parody and on content that isn't actually owned by the attacker, but which they might try to secure a fee for "protecting". So that's Article 13. And to be fair, I can live with that. It's stupid but it's unpoliceable. The meme police will never keep up. I'm a social media addict and I can't keep up. Forget it. As the Bard famously, said "THIS CONTENT REDACTED FOR LEGAL REASONS". But Article 11 is the really stupid, kick in the teeth. This is the article that says if you link to something copyrighted, you'll have to pay a fee. The "link tax" is going to cripple sites like Wikipedia (which is infuriating but so very valuable as a resource) because every man and his dog will charge a fee to connect to materials. Google will absorb the cost and grumble but carry on as before, but the aforementioned Two Pauls Site of Fun and Frivolity won't be able to do the most basic thing on the internet - share information - because the fees will cripple the plucky little start up. And let's not forget, sharing links to content is what the internet is. CNN, the New York Times, this newsletter, the BBC, NBR, the New Zealand Herald, Stuff, every movie that's been released since The Phantom Menace, they've all made use of the internet as a marketing tool, to share links as a way of encouraging attendance at, or purchasing of, content. Scroll to the bottom of this page and you'll find dozens of links. Every underlined sentence is a link. It's ubiquitous and essential and now the EU says it's taxable. I shall have to take it further. Every time I'm quoted in a news story, every time a tweet is taken by a newspaper and shared as if it meant something, every time a newspaper refers to another source of information, I shall issue a takedown notice and see how far I get. That's just silly, you say. And you're absolutely right. It's absurd. 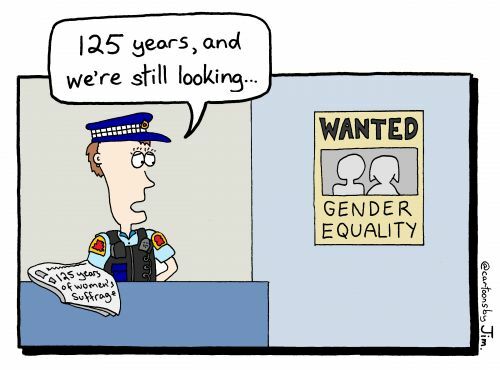 It's 125 years since New Zealand women were given the vote. I've written that sentence several times this week and every time I've had to re-write it, because of course "New Zealand women" were not "given" the vote: the fought for it, and wrestled it off the patriarchy. So it's 125 years since women won the right to vote in New Zealand, but we still use the passive voice when talking about women and we still refer to women as if they were something else (even this sentence assumes you're male). And we still have a skills shortage in New Zealand and indeed around the world because women don't like to do maths or software development or engineering, it's not our fault but they don't want to. Except that's not true either. I know plenty of women in technology. I've seen plenty of women who can code, who can run teams, who can own businesses, who can compete in online games, who can work for multinationals and deliver results. I know women who fly planes for a living and who are far more capable at tech-related activities than I am. But somehow we still don't seem to have many women joining the ICT field. At TUANZ I was a regular attendee at tech events. I would always count the crowd (old habit as a journalist - count the front row to get a base, count the number of rows of seats, report accurately on the number of people) and would count the number of women on one hand. Always it was on one hand. When you exclude the conference organisers (nearly 100% women) and the PR people (at least 75% women) there were generally only enough to fit on one hand, regardless of the size of the audience. Surely this year, I thought, we'd see an end to all that, but then of course Facebook reared its ugly head. Facebook (motto: it's all our money, you can't have it) has of course become an advertising behemoth and as has been discussed before, those who pay get priority over your aunty's holiday pictures or that post from the group you belong to about saving the whale. Those who pay get a tremendous dashboard to fiddle with. You can target advertising at a geographical region, at an age group, at fellow racists, at left handed New Zealanders living in the US who earn more than $45,000 a year. You can also target your advertising at men, and exclude women, if you so wish. This is of course discriminatory and arguably illegal or, as Facebook would have it, a feature not a bug. Guys (and I do mean guys) we need to get past this. We need to address the elephant in the room and 99 times out of 100 that elephant is us. Let's figure it out, eh? Facebook Business - Why can I only target ads to men and women when folks can select other genders? I do like that old adage about "if trees provided wifi we'd all be out planting them everywhere but they don't, they just provide oxygen" which is funny because it's true. Now of course trees that get in the way of the wifi (or, in this case, the fixed wireless signal) are up for the chop because one court believes internet access is some kind of basic human right or something. I like trees, but I also like wifi and internet access, but if my neighbour chopped down one of my trees (I have a gorgeous "dwarf" pohutukawa that will never grow more than 3m high. Currently it's about 12m and about to turn a gorgeous red) I would burn his house to the ground or some other excess of hyperbole. While the judge in this case said no, you can't chop the trees down (they mostly block the view and the internet interference could be resolved with a receiver on a pole) she did say: "undue interference with a wi-fi signal caused by trees could constitute an undue interference with the reasonable use and enjoyment of an applicant's land for the purposes of s 335(1)(vi) of the [Property Law] Act" which is legal code for why not try it and see what happens. I'd like to think we could live in harmony, our trees and our wifi receivers, our fibre connections and our driveways, but this is not to be. Not yet, at any rate. Speaking of driveways (ED: I see what you did there), it's time to update you all on the seemingly never ending saga of Getting Fibre Put On At Home. Astute readers with good search engine skills may recall that I had fibre put on at home quite some time ago. Despite setting a time when a chap would visit to assess the property, some fellow turned up at random and started walking around wearing his high-viz vest. Me: I'd like the connection to come in at the back of the house where the home office is. Him: No. It will attach overhead at the front where the old phone line went. Me: Ah but I have a star-configuration CAT6 network throughout my house and the access point is at the back. Him: I don't know what that means but I'm not connecting there, it's going in overhead to the front. Me: But that just won't do. Him: If you reject my design you'll go to the back of the queue and we'll revisit your connection after we've done the rest of the Auckland peninsula. The connection is in and works well but it means that at one end of the house I have poor internet because reasons. So now that we're ripping up the driveway to put down one that isn't made of crazy paving and tree roots I thought "Great, I'll get in touch with my RSP who will arrange it all and I'll just grit my teeth about the cost." Sadly, that cost is, apparently $4500 for a connection that's roughly 15m in from the kerb, and which won't be buried under the new drive but will have to be micro-trenched across the damned thing. Maybe wifi isn't a bad option after all.